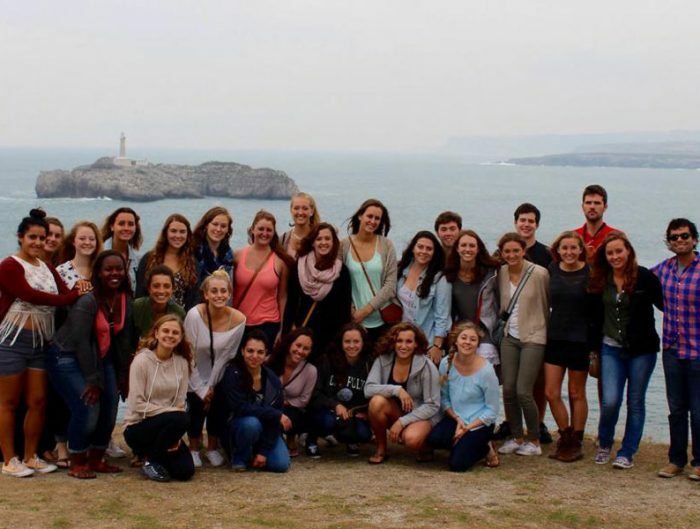 One of the amazing perks to studying abroad in Spain is the proximity to so many other places, people, and cultures for you to experience! 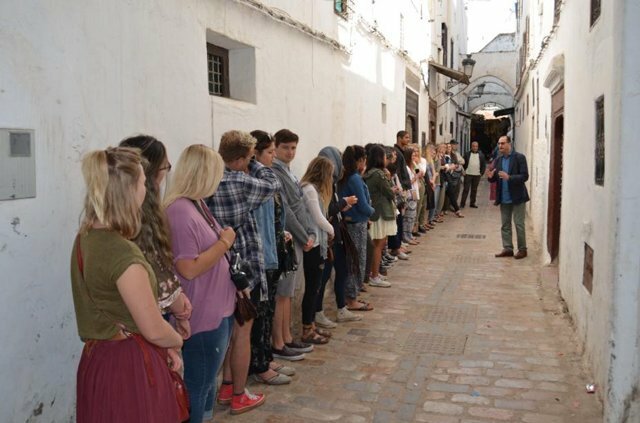 One experience that has been a student favorite is our field study to Morocco offered through our Alicante, Spain program. 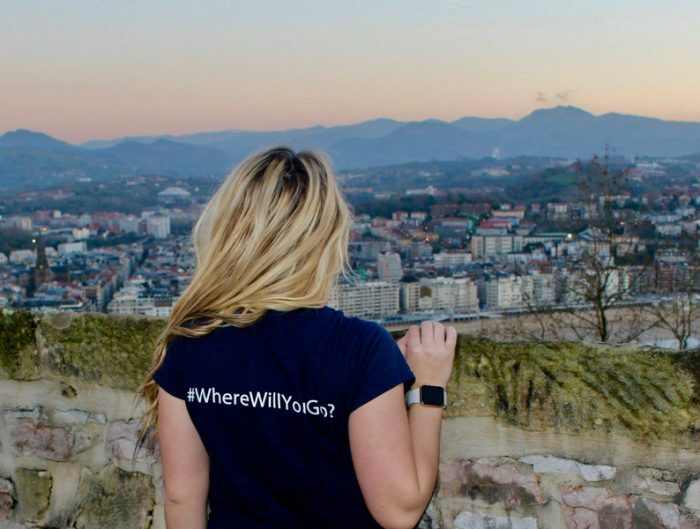 Being such a staple field study option, we wanted to share our students’ thoughts on the field study and why it’s such a unique and eye-opening immersion opportunity! Morocco is a country that will pull your heart out, paint it with colors, sounds, and smells, place it back in your chest and you will never be the same. Morocco is worlds apart from the neatly packaged lives many of us live in the United States. 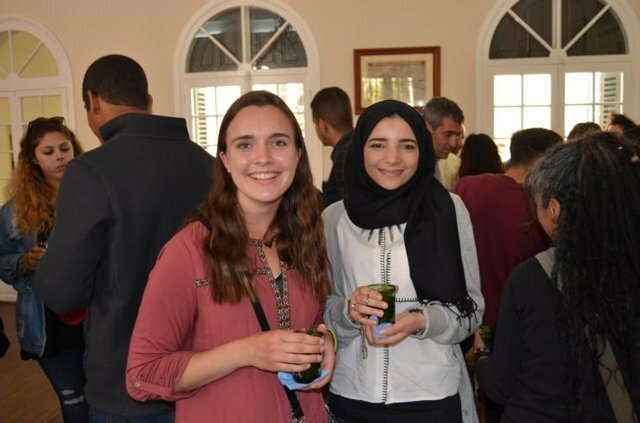 This Islamic country whose official languages are Arabic and Berber, along with the wide usage of French, maintains cultural traditions, customs, and rituals that will challenge the average American’s idea of everyday norms. Five times a day a call to prayer echoes out across the cities from the mosques, creating surreal moments of chanting devotion. Narrow streets are crowded with people who effortlessly avoid the 3-wheeled motorcycle trucks that move people, food, supplies, and animals. 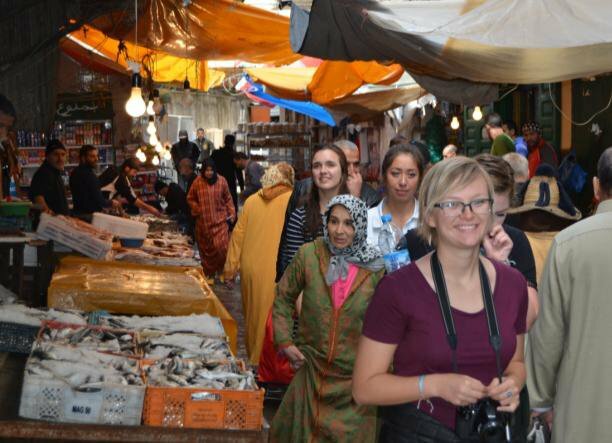 A walk through the street markets of Tetouan, Tangier, and Chefchaouen is a memorable experience in itself. Traditionally dressed old ladies sell their vegetables and eggs. The fish vendors display boxes of silvery aquatic bodies piled in parallel. There is no ice to be seen and the smell is nauseating. Then there are the chicken butchers; whole carcasses hang for sale or are neatly portioned for purchase. If you happen to glance in the back you might witness the last pleading glance of a chicken on the butcher block. It is stark, everyday life. Cats rule the streets and scavenge under vendor tables for fish heads and other scraps. The fruit vendors display mountains of bright red strawberries which seem to balance out the gore of the butcher shops. 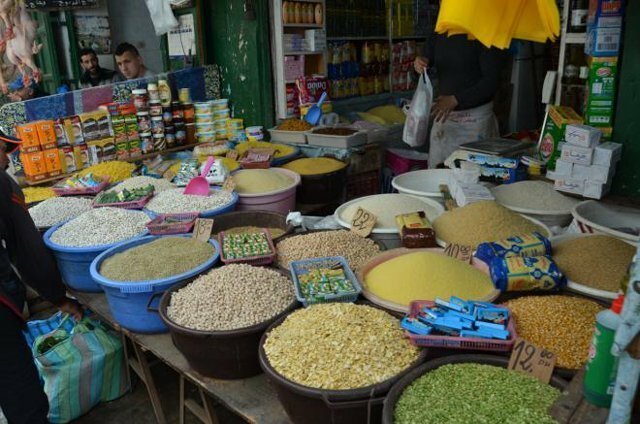 Beans, root vegetables, oranges, onions, garlic and more add color to the busy streets which are filled with loud men and the softening presence of the modestly covered women doing their daily shopping and chatting. There are small stores filled with knock-off watches and jewelry, followed by shoes stores touting supposed birkenstocks, converse and others. Waiters stand in the streets in front of their restaurants recruiting customers with promises of food and drink – the best in town. Morocco is alive, raw and fascinating. 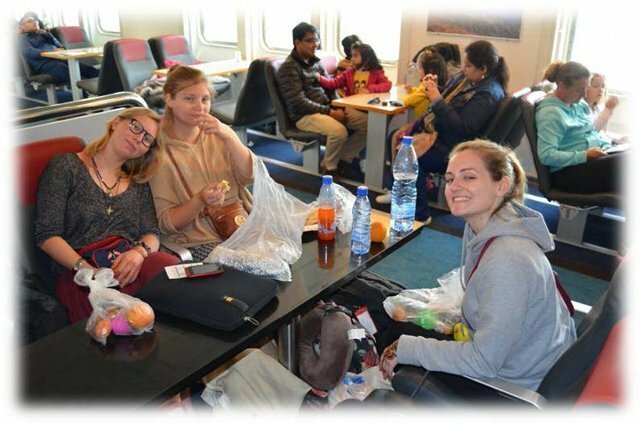 The ferry ride was a poignant memory; it defined and reiterated the concept of two sides of the Mediterranean. Being able to see two continents at the same time in my peripherals is a profound memory that will be etched in my brain. 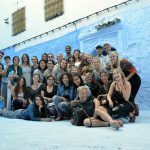 The experiences I am taking away from Morocco are unlike anything I have been a part of, and I would suggest this tour to anyone who is able to go. The trip cultivated great opportunities for building relationships with the other students. We spent so much time together on the bus, on the ferry, in the hotels, on the tours and in the restaurants. I got to have conversations with people I had only met in passing. We spoke in a large group, raising our hands high to question what life was like on these two different sides of the world and to anxiously share our experiences, thoughts and opinions with one another. The meeting was a valiant and ultimately successful attempt at crushing stereotypes we had held of one another. The topics we covered ranged from dating in Morocco to being a Muslim woman to perceptions of the United States in today’s political climate. Participating in this discussion was one of the most eye opening experiences I have ever been a part of. I went into this meeting and this trip to Morocco thinking I was not ignorant, thinking that I was not prejudiced; I had been wrong. On this trip and in this meeting I learned more than I could have ever learned from sitting in a classroom, or reading news articles online. 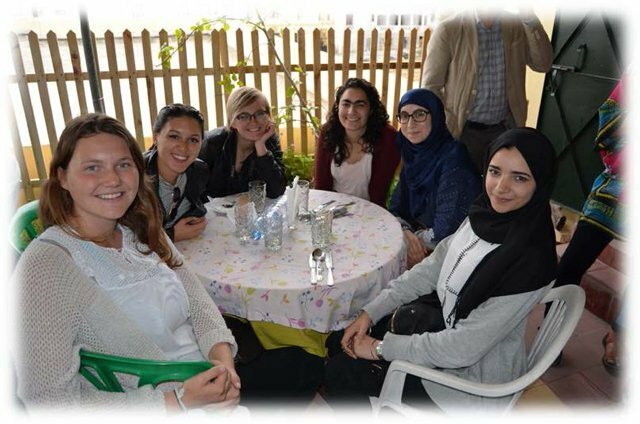 Later that day, we were lucky enough to spend some more one on one time with the Moroccan students as they came to lunch with us at DARNA, a women’s NGO. I enjoyed this part of the day even more than the large meeting because the coordinators of the meeting made sure us Americans spread out and sat at tables with USAC students that we did not know very well. They also made sure that a Moroccan student or two sat at each table. Here, the conversation became more personal. We spoke about our favorite movies, our dating lives and our dreams for the future all while eating a delicious, traditional Moroccan meal. Before we left the restaurant, we all took photos with our new Moroccan friends, attempting to savor and remember this afternoon for the rest of our lives. Whether or not I still have the photos we took years down the line, I know that I will always remember this meeting in Tangier. 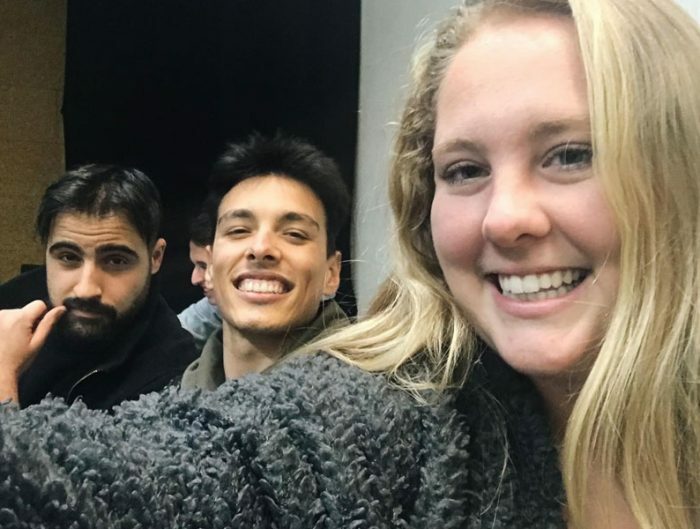 Being able to come together as students, as people, and ignoring the different nationalities and religions we all identify as was an amazing experience and something I would highly suggest to anyone. My favorite part about this trip was definitely meeting the Moroccan students. I thought it was really interesting to hear from their perspective the different types of stereotypes they have against Americans, as well as talking about the stereotypes we had about Muslims. 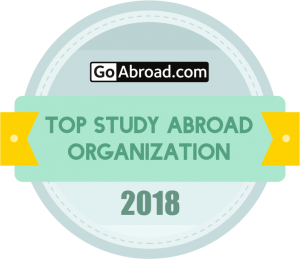 It was a very eye opening experience and it honestly made me feel safer and more comfortable being in the country because it put faces to what otherwise would be a completely unknown culture for me. Hearing them talk about wearing the hijab was really fascinating because prior to this experience, I had kind of considered the hijab oppressive to women but at the same time, I wasn’t really sure I was right to hold this view since I didn’t know much about Islam. Their level of respect not only for their culture but American culture as well impressed me. In my opinion, those students articulated and summarized their thoughts more concise than us Americans. I was enthralled with what they were saying. I had never taken the time to listen to a Muslim woman about her personal opinion on wearing a hijab. I think the majority of uninformed westerners (like myself) see hijabs as a female being oppressed. However, after a few of the women explained why they wear the hijab, I now have a clear understanding of the purpose and utility of it. One student said that the hijab was more of an attitude rather than just a piece of cloth; she finds solace and newfound individuality wearing it. I think that’s so cool. 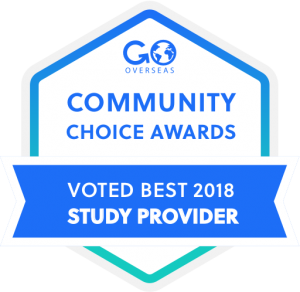 I’m thankful to USAC for arranging this because I think it’s important to always be pushing your own world view and hearing from other cultures. I was especially glad to hear from the women about how they view their role in society and in Islam. The labyrinth that is Tetouan’s Medina was almost shocking – there was just so much going on. My senses were overwhelmed as we walked single file through the wet cobblestones, smelling fish mixed with the spices and herbs, watching stray cats gnawing on sardine sized fish. Tetouan was an experience! I’m so glad we went and saw the market because it was so authentic and interesting, but it also made me feel culture shock for the first time since coming to Spain. There is so much history in the Medina, and it’s cool in a way that so many professions and the market itself hasn’t changed across so many centuries. In every society, there are populations that are neglected and perhaps deemed useless. 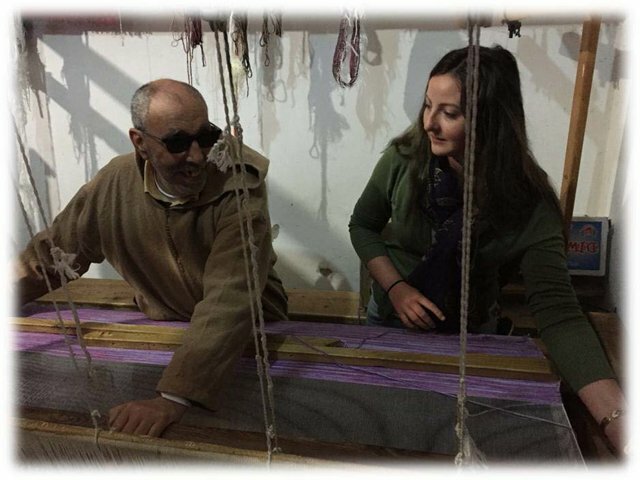 The blind in Morocco fall under this stigma whether the loss of sight be due to a childhood accident or an adult that has lost their vision and must relearn how to live, how to find their way through the winding labyrinth of streets to the market or have lost their job because they can’t see anymore. The feeling of being unable to contribute to their family or the weight of being a burden can be an overwhelming blow of devastation. Society often does little more than kick these people to the side where they are ignored. The social infrastructure lacks the support they need and this is the void that is filled by various non-governmental organizations. OAPAM’s (The Alaouite Organization for the Protection of the Blind) mission is to provide support and income for these members of society, giving them a sense of pride and purpose. Saïda is the president of OAPAM and describes how her mother previously led the organization. She learned and followed in her mother’s footsteps with dedication. OAPAM teaches the blind how to spin wool and make textiles to provide a form of income. OAPAM also works to teach the blind skills that they need in life. Ahmed, who is blind, serves as the vice president and trains all of the blind people. Watching him weave the yarn into the fabric on the loom is amazing. What he lacks in vision, he makes up for with touch in a manner that makes sight seem unnecessary. He runs his fingers across the hundreds of taut strands of yarn and immediately knows if one has broken and needs to be replaced. He expertly runs the loom and is proficient in his system to differentiate colors of thread. We then had the opportunity to buy blankets, pillow cases, jackets, and more all made by the blind. It was an honor to see the work that they create and hear about the lives that are changed for the better. Starting off our time in Chefchauen at NGO OAPAM: Women’s association for the visually impaired and blind women was the best way I think we could have started the day. Just being around the woman who is in charge created a great atmosphere to begin with, which I thought was amazing. This woman is so happy about what she does that her excitement and happiness were contagious. This association is amazing, they create jobs for the blinds so they don’t feel like they are useless, so they can feel that they are helping their families in some way. I was so amazed at the work the people who are blind did because I, someone who has their site, definitely would not be able to make such breathtakingly beautiful creations. I really enjoyed our visit to the NGO OAPAM! That was probably my favorite activity of the trip. It was very cool seeing how wool gets processed into something that can be used for clothing and blankets, and also so hearing and seeing how blind people can learn how to make very impressive products. Usually, in underdeveloped countries (and sometimes in developed countries), disabled people find it practically impossible to be successful or even have all the recourses they need. It’s very inspiring to see organizations like NGO OAPAM helping blind people be able to support their families. One of my favorite experiences in Chefchaoeun were the baths. The one I visited had been around since the 16th century and was still in use by local women. I felt like I had been transported back into time while at the baths. Women and their daughters came together to share the day together as well as friends and neighbors. There was a sense of community within the baths. Traditionally, women in Morocco dress very conservatively outside of the home in accordance with their Muslim faith, but amongst women in the baths, they were able to be free and open. There was actually a bride and her family at the baths at the same time as I was. All of the women were shouting and singing and dancing for her. Her family was bathing her to prepare her for her upcoming wedding that night. Being one of the only foreigners there, I felt like I was truly witnessing Moroccan culture. 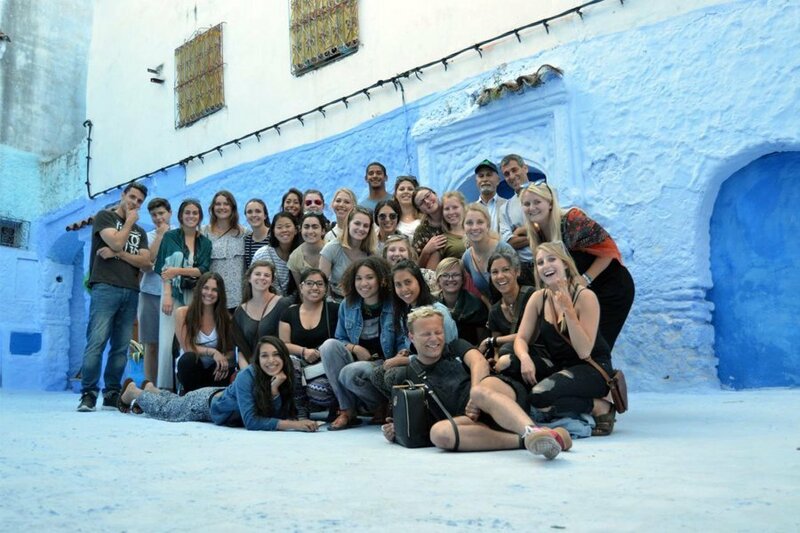 Overall, the Morocco trip with USAC was a once in a lifetime trip to both see Morocco and experience it. I would recommend it to every USAC student. The way to Morocco was a lot better than I was expecting, the bus overnight was easy and the ferry was smooth sailing as well with no sickness at all. It was incredible to see how close Morocco and Spain are, literally an hour ferry ride away. Morocco was such an incredible experience, everything is planned out so well and I loved the fact that we didn’t do super touristy things. 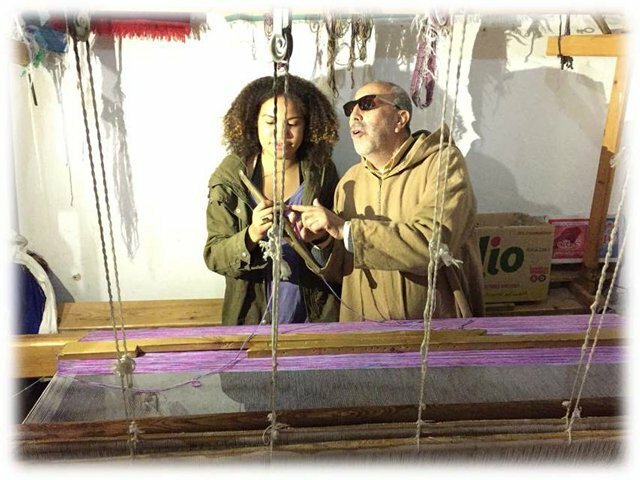 It allowed us to be more immersed in the lifestyle of the Moroccans and it allowed us to be more aware of their culture and religion. My expectation of Morocco completely changed after the trip. I would highly recommend this incredible experience that I was so privileged to have! The overall experience of the Morocco tour was one I will never forget and I honestly think the people who weren’t able to go seriously missed out on an adventure of a lifetime. Thank you, USAC, a thousand times. I took a lot away from this trip, and am grateful for the planning and hard work that you put in for us to enjoy and learn.